My boys had the opportunity to learn more about Newton's three laws of motion (physics), speed and safety today. 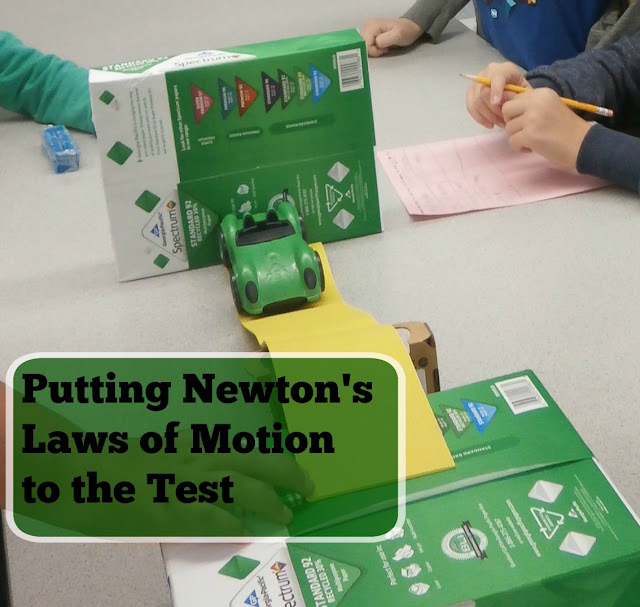 We had signed up for a class through a local 4-h club and with the use of rulers, cars, paper, ramps, and Lego characters they had a wonderful time putting these principles into practice along with 28 other homeschooling kids from our area. An object at rest will remain at rest unless acted upon by an unbalanced force & an object in motion will stay in motion unless acted upon by an unbalanced force. Acceleration is produced when a force acts upon a mass; the greater the mass the greater the force needed to move it. For every action there is an opposite and equal reaction. The teacher spent some time going over the different laws and explaining what they meant. They all talked about what it means to be distracted and when that could be dangerous. Then they had the children get into small groups and put some of it into practice. They handed out rulers and each child took turns trying to catch a ruler that a friend dropped through their fist; measuring where their hand landed on the ruler. If they managed to catch the ruler at the very bottom they had good reaction time but if the ruler fell to the floor of they caught it at the top their reaction time was slower. Most kids had a great time and did pretty well catching the ruler. They all took turns dropping for a friend or catching it. They recorded all the measurements for their group and compared to see who caught the ruler the quickest. They were then asked to distract each other while dropping/ catching the ruler and seeing how that affected their reaction. When the experiment was done they talked about distractability and it's affect on reaction. For the second part of the class the kids were given toy cars, little Lego characters, a ramp, and some reams of paper. They were asked to use the ruler to record how far the car went when the ramp was only two reams of paper high and then compare it to a ramp that was made up of three reams of paper. Once they had a few measurements from both heights they compared which went further and why, what force was acting on the car, why the car went further if the person added additional force to it, etc. It was great watching them all add up large numbers in their head too and seeing them willingly writing for the sake of record keeping. The kids then experimented with what happened when their car crashed into an empty cardboard container, the same cardboard container with some clay weighting it down, and a ream of paper. They also experimented with making the car faster and putting more force behind their push off. They soon found that the empty cardboard container was pushed further and the ream of paper barely moved. They figured out that the faster the car was going and the more force the car had behind it the harder it crashed into things. The Lego man went flying out of the car on just about every crash and they all talked about why car companies use crash test dummies and how they make cars safer. It was noisy, a bit crazy and lots of fun. I'm sure it's a lesson they won't forget anytime soon!